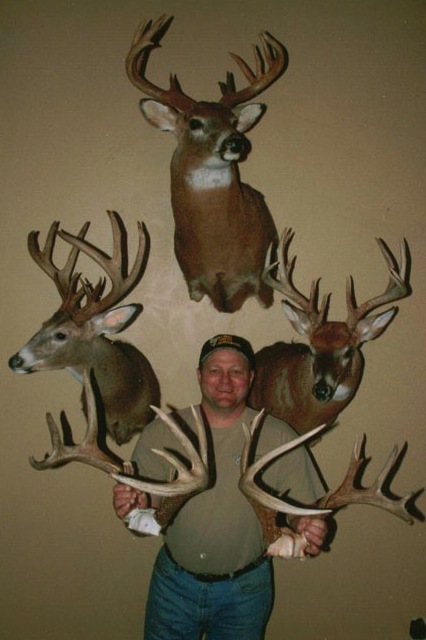 Here you will find Illinois deer hunting testimonials and Illinois outfitter reviews for Illinois Trophy Bowhunters. Who better to tell you how great the hunting is in West Central Illinois than actual clients who have booked Illinois deer hunts with us. 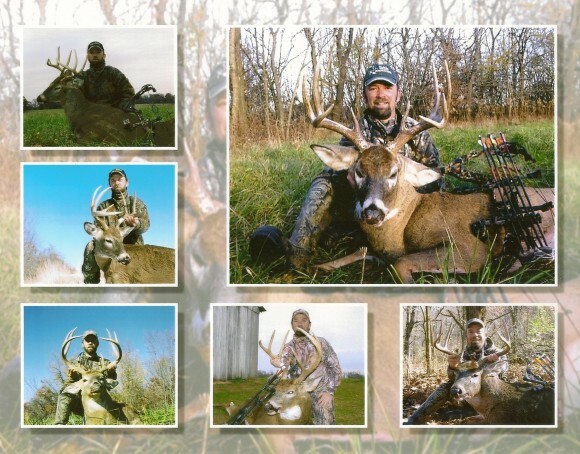 Each of these clients have bow hunted Illinois and are excited to tell you about how great Illinois Bow Hunting is. 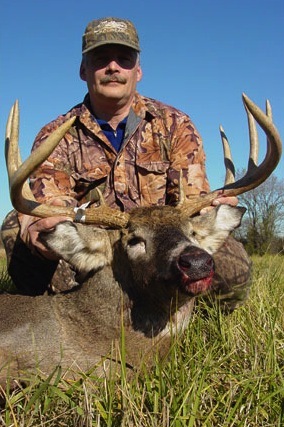 At ITB, we take great pride in making sure your Deer Hunt in Illinois is enjoyable and memorable. Many of our clients, as you will read bellow; have hunted with us several years in a row. The fact that they continue to bow hunt Illinois with us year after year should tell you that we are one of the premier outfitters in Illinois. We are one of the few Illinois outfitters who can proudly state that 70% of our yearly bow hunting clients will rebook their deer hunt for the following year! This high rebooking rate is one of the reasons you do not see us at the annual Sportsman Shows. Since we are usually over 90% booked by Christmas, we have nothing to sell when the outdoor show season starts in late January. 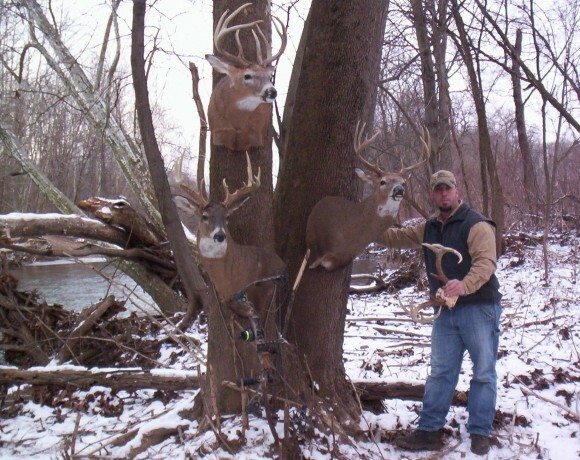 So check out these Illinois Deer Hunting Testimonials and contact us today to book your next Illinois Bow hunting trip! 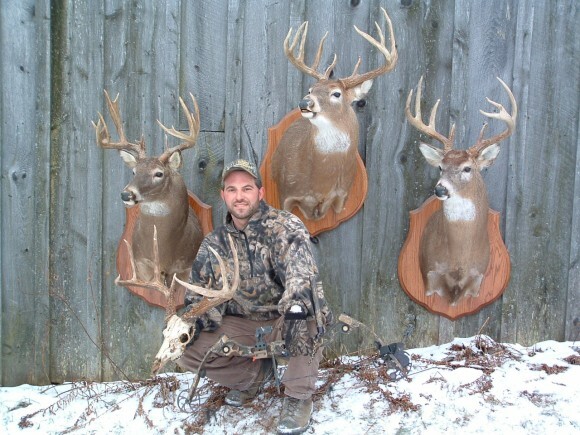 Here is a picture of the last 6 years hunting with Illinois Trophy Bowhunters. These 6 years have been the best in my bowhunting career of over 20 years. Hunting with ITB in Pike County Illinois is truly a first class bowhunt that I would recommend to anyone in search of the ultimate hunting adventure. The hunting areas are unpressured, the deer are plentiful, you see a lot of bucks doing the things that you read about in all the top hunting magazines. The guides are very knowledgable, they hunt stands with the right wind and they set you up where you are going to have the best chance at a nice buck. If you are serious about hunting for a world class buck give them a call, I am glad I did! Dear Steve, On behalf of Doug “Tiger” Mehaffey, Travis Mehaffey, Lynn Mooneyham , Kevin MaCormick and myself, I am sending this short report. We had a great hunt this year (our 5th year) at Wolf Creek, and as you probably have heard, Travis took a tremendous 190 gross buck this year. In addition, Lynn’s 8 pointer is over 140 and 21” inside, my 8 pointer is near 140 and almost 20” inside, and Kevin’s buck is a 150 class 10 pointer. The tree I have hunted and taken bucks from each of the last 2 years had water 8-10 feet deep! Herb Rush went out if his way to find me another location on the farm and he did a great job. Friday I saw a great 8 pointer that would have been well over 140 but a G-3 and a brow tine were snapped off. Herb and I also saw another big buck while placing my stand that we agreed was 150 class with dark antlers, a buck not seen during the hunt. Lynn’s buck had a G-2 snapped off and Kevin’s buck had a G-3 and a brow snapped off. Even the 190 buck had a significant drop tine, the diameter of a nickel, completely snapped off with a ½” stump remaining. There is some serious fighting on that farm. Thanks Steve for a quality hunt every year, Herb Rush is great and our accommodations only 10 miles away are just fine. We plan to be your regular customers for many, many years. This is our Mehaffey family and friends. 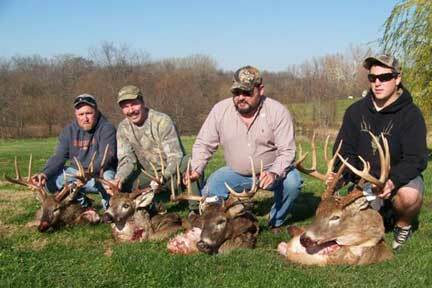 Each hunter has taken the best buck of his life with ITB, and all on the same farm. They are a great example of dedicated hunters working as a team with ITB guides for hunting success. They will be returning to hunt the same farm for the 6th year. I would like to take this opportunity to thank ITB for my 2008 hunt at the Hadley Camp. Their decision to only hunt the rut during a 3 week window gives hunters the chance at a buck of a lifetime as well as keeping hunting pressure at a minimum. I found that my key to success was listening to Guides Donnie McDowell and Camp Manager Mark Hively on deer movement and to stay in all day. The management practices at ITB are evident by the amount of deer I had encounters with during my hunt. The first morning of the hunt I had a 140 class buck at 30 yards. I ended up seeing 100 or so deer, 20-30 bucks of which 10 were shooters. The evening before the hunt I was glassing the farm I would be hunting and observed a 160 -170 class buck with a drop tine. Every day I had encounters with Pope and Young quality Whitetails. I ended up harvesting my best non-typical and a doe. Needless to say I am looking forward to the 2009 season. This place is truly where “Whitetail dreams come True” ITB put me on the bucks and I took it from there. That’s all I could ask for in an Outfitter. 2007 will start my seventh year with ITB. The guides at ITB have been very helpful with the success of my hunts, preaching to start early and stay late. A special thanks to guides Leo Litner and Gary Fry that have become lifetime friends due to our mutual love for the great outdoors. Thanks Steve, see you in the fall. I wanted to take this opportunity to thank you for another great hunt with ITB, this was my forth year with ITB and I look forward to many more. Your knowledge of the deer and their travel routes makes for an awesome experience every time you sit on stand. Bowhunting in my home state of Pennsylvania is only preparation for my real hunt with ITB……Thanks again and see you next year! 2007 was my fourth year hunting with ITB. I would like to thank Steve Phelps for the best week of hunting that I ever had. I saw 140 Doe’s, 58 Bucks and 17 Shooters in the 125 class and up. I shot my Buck on the fifth day of the hunt, which was great, because the first two years I shot my two 140 tens in the first full day out. I must say that ITB is my place to hunt. I listen to what guides say, and stay in the stand all day, which makes for less scent and activity going to and from the tree stand. I have seen some of my best bucks between 10:00 am and 2:00 pm. Here are the times I harvested these 5 bucks: 5:00pm, 10:45am, 4:30pm, 11:50am, and 1:00pm. The biggest Illinois buck I have seen while hunting was at 11:15am. Just wanted to take a moment to thank you for an absolutely fantastic week of trophy Whitetail hunting last month. Having the opportunity to participate in many archery hunts throughout the US and Canada I have gained a clear understanding of how critical it is to hunt with an outfitter that truly understands all aspects of a successful bowhunting experience, and Illinois Trophy Bowhunters Inc. has it figured out in a big way!! During my week of bowhunting, I was blown away, not only the number of deer that I saw, but the quality of the deer that I saw. In total I would say that I saw approx. 80-90 deer, with 10-12 of them being outstanding Whitetails ranging from 140 to an unbelievable 200”, and another 15-20 in the “almost shooter” range. I had several very close encounters at full draw with several very large bucks that never quite panned out, but I still ended up with a nice 125” animal. Your guides were very informative, and best of all they had a great passion for bowhunting Whitetails as well. The leased farm that we hunted was a fantastic piece of property that was the perfect combination of agricultural fields as well as thick timber for the deer to take up residency. This is one of the few hunts that I have been on that truly lived up to 100% of our hopes and expectations. I am already gearing up and very excited to get back next fall!! Thanks for the best week of Whitetail hunting of my life!! You guys are the best!! 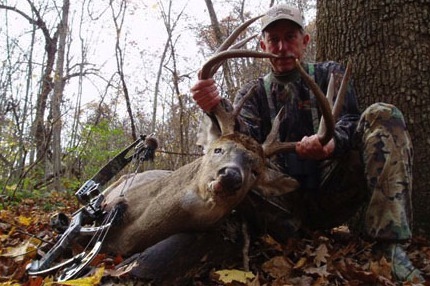 Archery hunting for mature whitetail bucks is not an easy game. It requires skill, practice and perseverance on the part of the hunter as well as patience, attitude and luck. These are qualities and attributes that an outfitter has no control over, along with the weather. 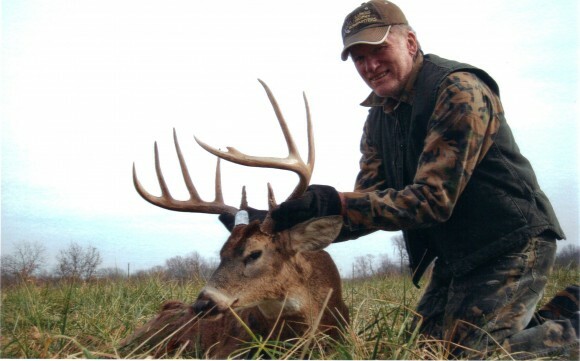 What good outfitters should do, and what Illinois Trophy Bowhunters does do, is consistently provide properly managed properties, well scouted by knowledgeable guides so as to give their clients a legitimate chance to harvest a Pope and Young class, or better, buck. My hat is off to Steve Phelps and my guide Leo Lintner for a job well done. I was able to harvest five bucks with ITB in five years from 2006 – 2010. 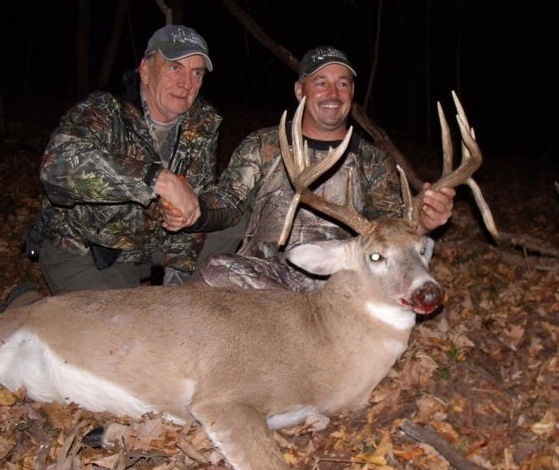 My favorite memory after harvesting my buck in the 2010 archery season was when I called my guide, George Wnorowski, to come and help me track my buck. Both Steve Phelps and George showed up with the ATV and while we were tracking my deer, we walked up on my huge ten point buck together. That is something I will never forget. It is a moment that you can never duplicate. I have been hunting for 30 years and have never hunted any place in my life like the Bluffs camp in Pike County Illinois provided by ITB. My biggest buck came on November 19th, 2010. I was hunting on the edge of a large thicket and high grass field between large cut corn fields. The opening day of the shotgun season was 35 degrees with a light west wind. I was in my stand 30 minutes before first light waiting for the sun to rise. I had full intentions of staying in my stand until the sun went down. I saw my first deer about 8:00 a.m. Two doe came in and bedded up in the high grass to my left for about an hour. Then they got up and headed into the wind disappearing into the high grass. I did not see any more deer movement until about 2:30 p.m. when there were 2 doe walking off and then a giant 10 point buck appeared, walking about 80 yards out stopping in the high grass giving me a perfect broadside, quartering away shot. I took the shot with my 12 gauge shotgun dropping the huge buck in his tracks. I got down from my stand, walked over to the deer and I could not believe the size of the deer. 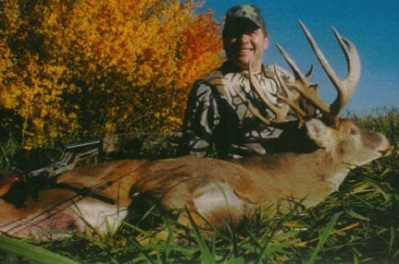 This was one of the biggest bucks that I have ever taken and the second 10 point buck taken in Illinois in 2010. Thank you Steve Phelps and ITB for a year I will never forget. 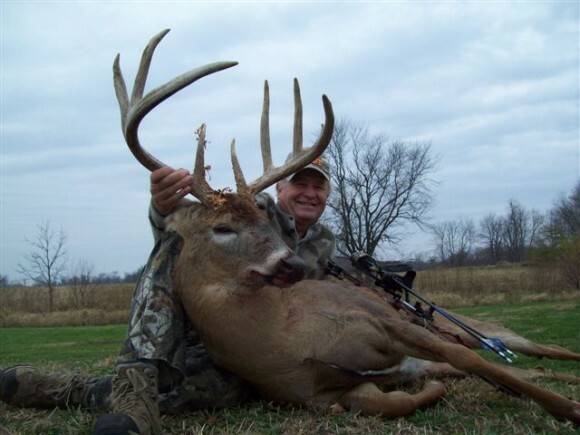 In the fall of 2010 after reading an article in Bowhunter Magazine, I called and talked with Steve Phelps, the owner of Illinois Trophy Bowhunters (ITB). Right away I knew he was a serious bowhunter. He explained that ITB only wanted experienced bowhunters who were seeking to harvest 125 plus bucks. If you shoot a smaller buck on one of their hunts, there would be a fine and you wouldn’t be allowed to return. Steve suggested if I was serious to come out and walk their hunting land and get to know the area I would hunt and also look for sheds. I was impressed so I booked a hunt for November 4 through 9 in 2011. In March I drove out and met with Steve and spent two days walking his leases. I also met Brian Bergmann, his partner, and Travis Dalton, one of his guides. These guys are the most intense bowhunters I have ever met. Their hunting land is equally impressive. Fast forward to November 2, 2011. A friend from Virginia, Farron Moss (also hunting with Steve) and I drove out to Springfield. We met our guide, Jim Riggins, for breakfast. He filled us in on everything we needed to know, and we followed him to our accommodations. Farron and I were able to hunt that afternoon. I saw several does and an eight-pointer in the 100 class. On day two I moved my stand (a climber) 100 yards south. I saw 25 to 30 does and probably the same eight-pointer. That night Jim talked with us at the lodge and said he would come in and move me in the middle of the day. That morning I again saw many does and three or four small bucks. Jim came in and showed me an area where the bucks come off a ridge. We picked a good tree and I climbed for the evening hunt. At 2 p.m. I had a doe bedded within 40 yards of me for two hours. She left and by 5:15 I had does steadily walking past from the ridge to the north. A few minutes later a herd of 12 to 13 bucks came off the ridge and began worrying does in all directions. The last buck off the ridge was the largest and it didn’t look like I would get a shot. He turned and walked around behind me downwind at 20 yards in thick stuff. I was wearing clean clothes and also Scentlok. He passed behind me and then turned and walked on a trail that would give me a 25 yard shot. When the buck walked behind a bush I came to full draw, and as he entered my shooting window, he paused. The arrow was gone and the shot looked good. I didn’t see the deer fall, but it sounded like he piled up. Now I have to sit down. Heart pounding and heavy breathing, this is what a bowhunter lives for. I called Jim and he was in the process of helping another hunter retrieve his deer. Jim said to give it 15 minutes and climb down and look for blood. I looked up and I could see the buck had piled up maybe 50 yards. I walked up on this buck, which Jim said was about 300 pounds on the hoof, and the horns looked small compared to the body size. It took four of us to cart the deer to my truck. Brian Bergmann met us at the shed where they field dress deer, and Brian green scored my deer. My buck scored 161. I was in shock. The next morning Brian and Jim took lots of pictures and then caped my deer. Brian then took me to Kurt Hergenrother, a local taxidermist. By killing my buck early I got to know everyone involved with ITB. 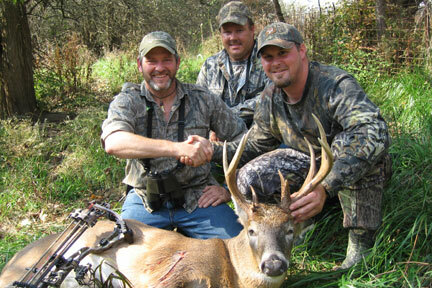 Everyone with ITB is committed to their clients and to making the hunt special. They really enjoy what they do and it shows. My hunt was a hunt of a lifetime. These people are more than my outfitter and my guide, they are friends! Yes, I have booked for 2012! 2012 will be my 9th consecutive year hunting with ITB in Calhoun County. In my first 8 years I have taken 5 pope and young bucks including a double drop tine deer in 2010. We have a group of 5-6 friends who have hunted the same ITB camp every year and we have all taken our best bucks of our lives. This can be attributed to scouting/shedding trips that we make each March when we get together with our guides Leo and Tony who have been on our property since ITB’s inception. On these trips, we hike the property, choose treestand locations and trim shooting lanes so when the season comes along we are ready to hunt and do not have to disturb the woods anymore than needed. Hunting and harvesting mature whitetails involves many factors including planning, patience, skill and a bit of luck. Sitting all day in a treestand is preached by ITB and can really increase your odds of taking the buck of your dreams. 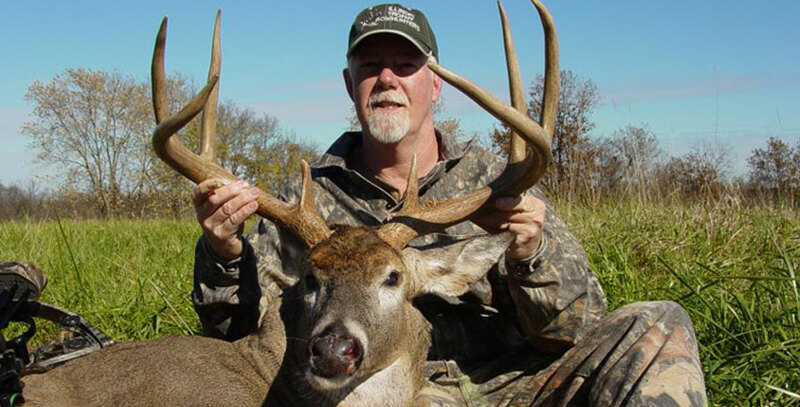 Harvesting a trophy whitetail also involves proper management of the animals being hunted. ITB does this by having 125-140 inch minimums and also by only archery hunting the 3 weeks around the rut and the first 3 day shotgun season. This gives many deer a chance to reach their potential and grow older.